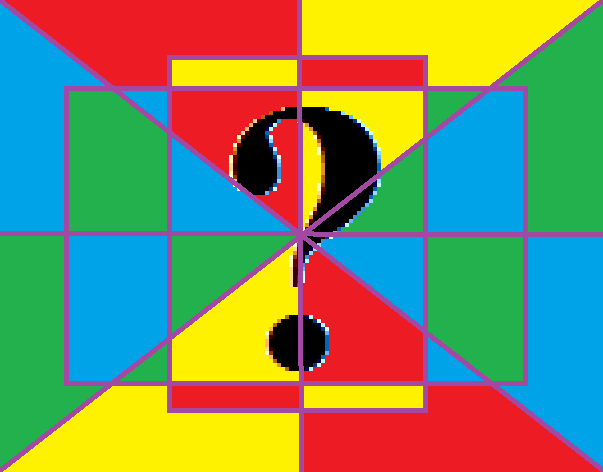 This is a puzzle I made up not long ago. After trying to solve it for a bit (no success yet, but I haven’t given up), I decided to share the fun. 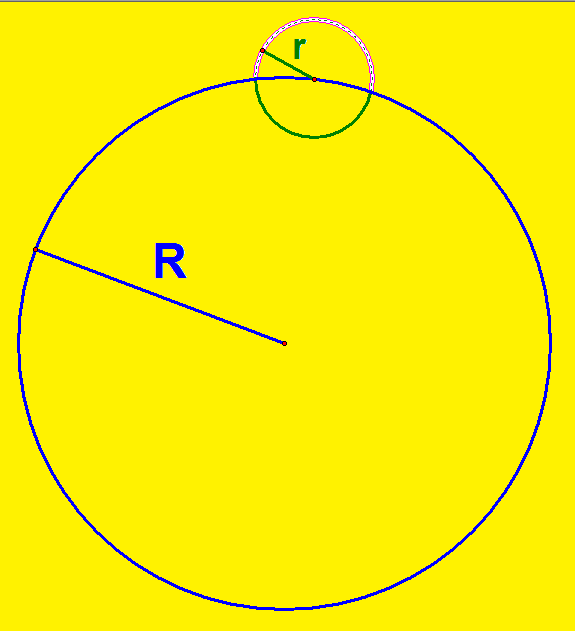 A small circle of radius r is centered on a large circle of radius R. It is a given that 0 < r < R. In terms of r and R, what fraction of the smaller circle’s circumference lies outside the larger circle? I am 90% certain there is an extremely simple way to do this, using only things I already know. It’s frustrating that the answer isn’t simply leaping out of the computer screen, at me. For simple math problems, that’s what usually happens . . . so either this is merely deceptively simple, or I am missing something. The figure above, rotating in hyperspace, is an orthogonal projection of a four-dimensional polychoron known as the truncated tesseract. It is analogous to the truncated cube, one of the Archimedean solids. The image below is of the same figure, but is shown as a perspective projection. Both images were created using Stella 4d, software you can buy (with a free trial download available, first) at http://www.software3d.com/Stella.php. It’s great software, and a friend of mine wrote it — but no, he doesn’t pay me to give his program free advertising, as some have wondered. A major challenge for many Aspies (an informal name many of those with Asperger’s use for ourselves) is communication with the larger, non-Aspie population. Frustration and anger are common reactions to this challenge — sometimes from both sides. The reasons for this are known: these two parts of the population use language quite differently. Aspies tend to use and interpret language in absolute, literal terms, to a point that seems odd to most. Non-Aspies, by contrast, are often more flexible with use of language, and are (somehow) able to convey ideas between themselves using words which mean the exact opposite of their literal meaning. (Several examples will follow.) This difference is all that is required to explain why Aspies and non-Aspies often have trouble communicating with each other. Just as with most people, Aspies are quite different from each other, but we also have some traits in common. For example, an intense urge to study and analyze some esoteric subject, which few others care about, is common — but the identity of that subject, or subjects, varies widely from one Aspie to another. My special interests all involve puzzles; I enjoy trying to figure out mathematical, scientific, and linguistic problems, in particular. Another Aspie might share none of those interests, but might be able to rattle off, say, hundreds of sports statistics, as easily as I can list the names of dozens of polyhedra. The existence of these “special interests,” as they are known, is (nearly?) universal among Aspies, but the topic of these special interests is not. For example, fewer than 1% of the Aspie population shares my obsession with polyhedra — a fact I know because the world’s most-focused “polyhedra people” are so uncommon that we have established many lines of communication between each other, enabling the formation of a rough estimate of this population. My estimate is ~300 people, worldwide. Even if I am off by a factor of ten, that simply isn’t nearly as many people as 1/10th of 1% of the world’s rapidly-growing Aspie population. In my experience, medical terminology, in particular, has provided large numbers of baffling puzzles over the years. When talking to medically-trained professionals, I always let them know I am a teacher of science and mathematics. This lets them know that they need not hold back with medical jargon, which has a large overlap with scientific and mathematical jargon. I can understand it fairly well, and, when an unfamiliar term is used, I simply ask for a definition. When I need to, I take notes. If medical instructions are not clear, precise, literal, and detailed, people can die as a result. For this reason, such instructions generally are written in a precise, literal form of English which is a beter match for “Aspiespeak” than what we typically hear from non-Aspies. On the other hand, when I speak to non-Aspies about medical subjects, I often get quite confused, and I suspect this happens with many other Aspies, as well. Examples follow. “Nerve pills” — As someone who takes prescribed medication for the relief of anxiety (which is the way a doctor or pharmacist would likely phrase it), I have occasionally been asked if I might benefit from taking a “nerve pill.” Before remembering the translation of this term, I always think, and sometimes say, something along these lines: “I’m already nervous. Why would I take a pill to make me more nervous?” It’s the implied, omitted parts of the phrase, of course, that contribute to my confusion. As it is, this practice makes me wonder why we don’t call deodorant “oderant” instead, a term coined by Jerry Seinfeld, since that would make equally little sense, but would at least be consistent. The related phrase “pain pills” elicits a similar response from me. Due to a fall over twenty years ago, I already hurt, and, sometimes, I need something that relieves pain — but I never need anything to cause more pain! Fortunately, the people I actually see for such medication, when it is needed, are physicians and pharmacists, and they use literal, precise terms for such medication. They also know the risks of such medication, and conversations with such people are important for anyone needing such medication, for obvious reasons: such medications should only be used in ways consistent with advice from doctors and pharmacists. Patients cannot obtain such advice without having honest conversations with these knowledgeable professionals. The most confusing informal medical term like this which I hear, though, is the term “crazy pills.” I don’t hide the fact that I obtain professional help for mental health issues, and explained my reasons for this openness here. Most of those who do seek treatment for mental health problems, though, are not Aspies, and so it is quite common to hear such treatment, in the form of medication, referred to by this confusing term, which I must admit I intensely dislike. For one thing, the word “crazy” is not one to use lightly, due to the fact that it has been used, historically, to stigmatize those who need help maintaining or restoring mental health. For another, the literal meaning of “crazy pills” is the exact opposite of its in-use meaning. The term I use to replace “crazy pills,” in my own speech, is “sanity pills.” Sanity is, after all, my preferred state, and that is the reason the psychiatry-related category on this blog is named “Mental Health,” not “Mental Illness.” Reminders that mental health is the goal are helpful; the opposite focus is not. Puzzles like this (figuring out non-literal terms used by non-Aspies) are not my favorite kind; in fact, I don’t enjoy them at all, for little or no logic is involved, and any pattern which might help me learn these things more easily has, so far, eluded me. Non-Aspies seem to just intuitively “know” what such phrases mean, as if they got a memo which was deliberately withheld from Aspies — and that is, for me (and many of us), both baffling, and irritating. Can I understand these things? Yes, with difficulty — I have to figure them out, step by step, each time, due to the fact that they do not make logical, literal sense, and thus do not come naturally to me. In fact, studying calculus was easier than understanding these common phrases which nearly everyone else just seems to somehow “know,” as if the knowledge was sent to them telepathically, but deliberately withheld from me, for reasons unknown. For a fictional depiction of Aspie/non-Aspie confusion, this clip from Star Trek: The Next Generation, while not medically-oriented, does illustrate this commuication-problem in a humorous fashion. When the character of Data was created, some “Aspie” characteristics were deliberately included, just as they were for Mr. Spock, his predecessor. Some Aspies have criticized the Star Trek franchise for these practices, but I, personally, think they have been helpful, in that they use humor to try to bridge the currently-existing comprehension-gap. This gap is not helpful, so anything that narrows it is something I like. Is the Moon a Magnet for Ignorance? Google’s search-suggestions for “is the moon,” shown above, clearly indicate support for the “magnet for ignorance” conjecture. 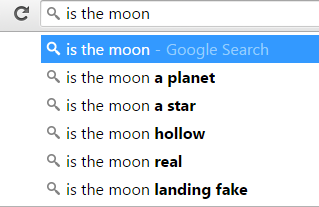 My favorite one from this list: “is the moon real”? I’ve looked into this, and there are apparently quite a few people utterly convinced that the Moon is a hologram, created by NASA, for reasons I have not been able to discern. Although I am a teacher, I am not an English teacher — but I also believe that, as a teacher of anything, I have an ethical and professional responsibility to promote literacy. Many such methods for doing so exist. This is the one I use. 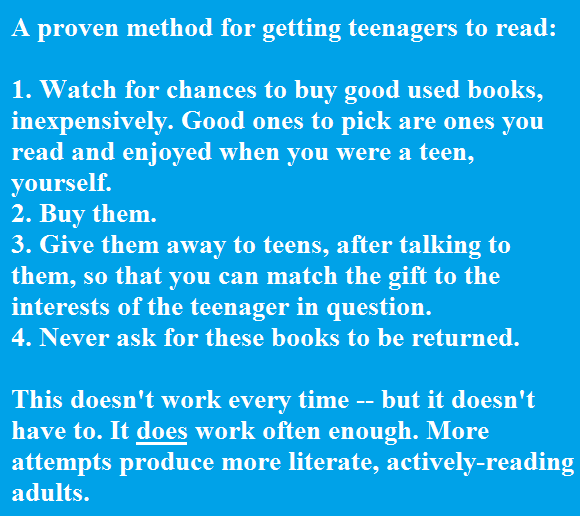 The authors I have gotten teens reading most often, with this method, are Richard Feynman, Robert Heinlein, Neil deGrasse Tyson, Jung Chang, Flannery O’Connor, and Stephen Hawking. If a teenager in a science class, a subject I do teach, completes his work from me, with a high level of accuracy, and in an unusually short time, I keep books by these authors on hand as my set of “emergency back-up teachers.” Turning bored students into engaged and interested students is, I am learning, the key to avoiding teacher-burnout — at least for me. Next on my list to add to the books I use for this ongoing project: multiple copies of The Autobiography of Malcolm X. I haven’t read it since I was in high school myself, and its impact still lingers. It’s very simple: errors in writing, of any kind, horrify me. If I wrote a book, and it were published, some would likely slip through, such as the one in the image above. If a book with my name on the cover had been published, and I then discovered an error, I would end up trying to get corrected copies to every buyer of the first edition, eating all profits, and then some. I also just don’t need that type of stress. Please do not misunderstand: I love books. Therefore, I do two other things, in lieu of actually writing a book (which has been suggested, to me, more than once). First, I read other peoples’ books. I seek higher-quality books to avoid those irritating typos, for they actually cause me pain when I see them. Even so, some slip through — ouch! — but at least the mistakes aren’t mine. I am almost immune to conventional causes of embarrassment, but this isn’t a conventional cause, and I certainly have no immunity to it. The other thing I do is to blog, which is, of course, another form of writing. It’s a perfect forum for someone with this writing-quirk — because, when I discover a mistake in my writing, even months or years later, I can edit it away in seconds. This is why, for me, blogging > writing books. However, I am grateful that there are good writers for whom the inequality symbol points in the other direction. The term “evangelical atheism” may seem like a contradiction, but, hopefully, the image above clarifies what it means. It’s the zealous pushing of others to abandon religious beliefs, and it isn’t helpful to anyone. John Lennon never, to my knowledge, publicly proclaimed a personal religious belief, but he didn’t apply the word “atheist” to himself, either; others did that. The same thing has happened repeatedly to Neil deGrasse Tyson, as he explains further, below. In both cases, these are people who are fiercely independent in their thinking, and not afraid to offend others — but that doesn’t mean they want to be associated with evangelical atheists, whose hostility to religion, and religious people, makes the world a more dangerous place. The more logical goal is a peaceful world, and that means one where the faithful and the skeptical can coexist peacefully. Evangelical atheists don’t write books. They can’t calm down long enough for that. Instead, they are more likely to speak out through angry and insulting videos they post on YouTube, harassment of believers (or agnostics, or those who simply don’t want to be labeled by others) on Facebook, and, of course, old-fashioned, face-to-face bullying. I prefer the term “skeptic” for myself, as I have explained here before, for I like that balance struck by that term: insistence on evidence, balanced by openness to new evidence, even if it contradicts previous views (about anything). I also don’t want to associate myself with the evangelical atheists, which is the primary reason I abandoned use of the word “atheist” for myself, some time ago. This made a few evangelical atheists angry, some to the point of losing all ability to reason (predictably), to the point of open warfare on my Facebook. To stop this, I literally deactivated that account for several days, that being the easiest option to shut that down quickly. As for Neil deGrasse Tyson and John Lennon, I will let them speak for themselves. Religious people aren’t going away any time soon. Neither are the non-religious. If we’re going to enjoy “living life in peace,” the hatred and hostility both need to go, from both sides of the “divide of belief” . . . and that isn’t too much to ask.